Many SCA members have scrolls that were given to them when they received awards from their Baron or Crown, or when they won a competition. But how much do you know about the work that went into making that scroll? It’s probably more time-consuming, costly, and complex than you think. 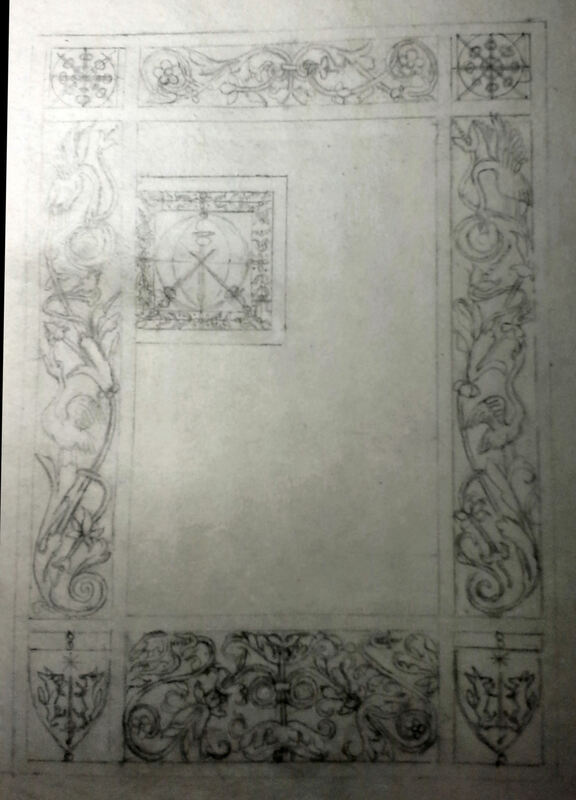 To give concrete examples, I will use the Master of Defense scroll I did for Maestro Orlando di Bene del Vinta last spring, with thanks to Maestro Orlando for giving his permission for the use of images of his scroll. The first step is when a scribe receives an email from the Kingdom Signet offering him or her the scroll assignment. For confidentiality purposes, the Signet usually doesn’t tell the scribe who the award is for at first; she asks if the scribe is willing to take an assignment, and may give them a general category of assignments available. For example, not long ago I volunteered to take an assignment for a local event, and then was asked which of several awards I wanted to do. I was not given recipient names, just the types of awards – Fleur, Sycamore, Cornelian, etc. Scribes will sometimes ask the Signet to assign them scrolls for their special friends, or if the Signet knows about relationships the scribe has with recipients, they may get assigned those scrolls, but it’s just as common for the scribe to know nothing about the person for whom they’re crafting the scroll. Once the scribe accepts the assignment, they are provided with the recipient’s name, the award, the reason it’s being given, and any other details the Crown has provided or the Signet has available. Experienced scribes who know multiple styles of illumination and calligraphy will usually try to match the scroll’s time and place to the recipient. This involves leafing through books or scouring websites for suitable manuscripts until the scribe finds the design that appeals to him or her and is best suited to the recipient. This can take several hours or even days; sometimes scribes will fall down a rabbit hole looking for the best fit, or just get caught up in the wonder of all the beautiful manuscripts out there. Some scrolls, usually peerages or backlogs, may involve discussions with the recipient since the award isn’t a surprise once the award or a Writ is given. When I did the Knighthood scrolls for Sir Byron and Sir Ariella, I asked about their general preferences, sent them links to multiple manuscript pages that matched their requests, and let them choose the design they preferred. Some people still prefer to be surprised, of course, but I really prefer to make sure I’m doing something that the recipient will like. Negotiations with the recipient for these scrolls can take days or weeks. 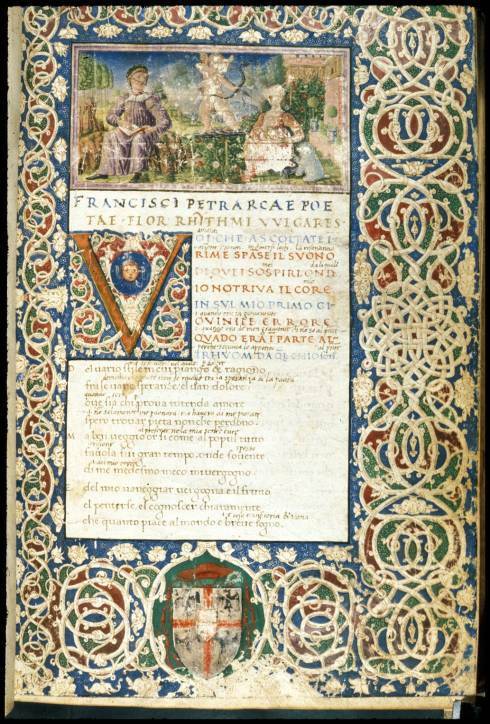 The manuscript pages below are just three of the 16 options that I provided to then-Don Orlando for his consideration, based on his preference for 16th century Italian. He chose the third one, from the Rangoni Bentivoglio Book of Hours, which was created around 1505 in Bologna, Italy. The next step is for the artist to gather the supplies and equipment needed to create the scroll. Depending on the level of award, the scribe’s finances, his or her relationship with the recipient, and other factors, the scribe could choose any of multiple media. Even assuming the scroll is the traditional paint on paper style (as opposed to wood or rock carving, embroidery, engraving, stained glass, or other less-typical media), the scribe needs to select whether to use watercolor paper, Pergamenata (a type of vegetable parchment that mimics vellum), or the much more expensive parchment made from goat, sheep, or calfskin. Some artists grind their own pigments while others use gouache from a tube (and many do both, depending on the scroll and their time constraints). The scribe might use gold paint or 24-karat gold leaf. Using the most expensive materials, a single scroll on vellum with gold leaf can cost the scribe as much as $100. Even for scribes using plain paper and paints, the investment in supplies can be substantial as a typical scribal toolbox contains $50 to $100 worth of paints and equipment. While scribes have sometimes received donations, most of the time they bear the entire cost of making the scroll. For Maestro Orlando’s scroll, since it was not only a peerage scroll but also the second Master of Defense scroll to be given in Æthelmearc, I wanted it to be special, so I scoured the Internet and found some lovely goatskin parchment for only $40 through Guild Mirandola. I already had gold leaf, walnut hull ink, and period pigments, so I decided I would use only period materials for the scroll. 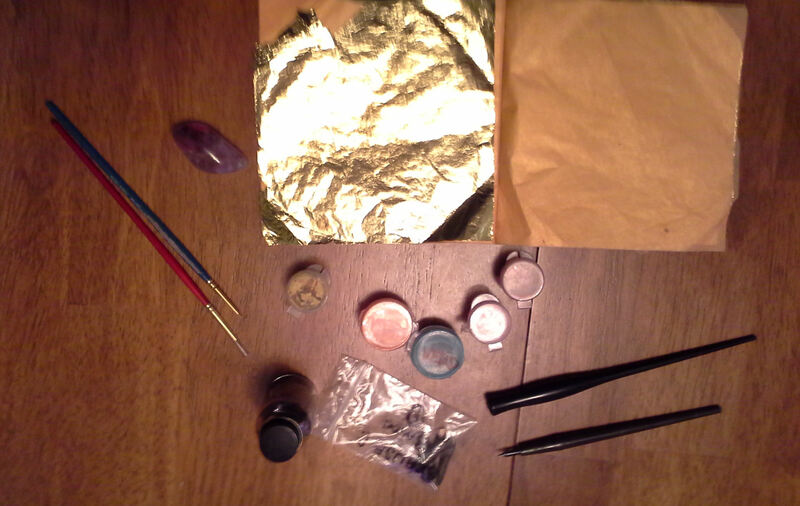 The picture below shows just a few of the tools and supplies I used: gold leaf, a tumble-polished amethyst burnishing stone, period paints I had previously ground and stored in small plastic containers, brushes, pen holders and nibs, and a small bottle containing the walnut hull ink. It took about 10 days for the parchment to arrive, and when it did, I was dismayed to receive it rolled in a tube. So I had to press it under layers of many books in a humid area for several days to get it to lie flat, then taped it to a heavy cardboard backing. 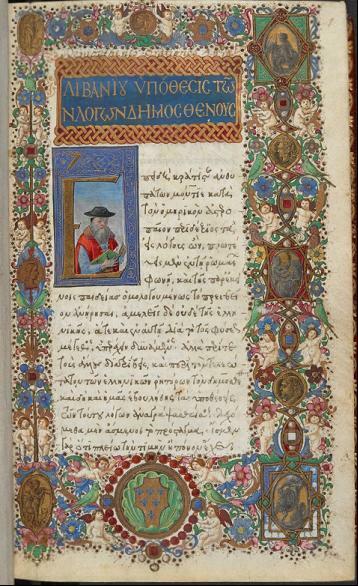 Now the scribe is ready to begin working on the design of the illumination. Different scribes have different ways of doing this. 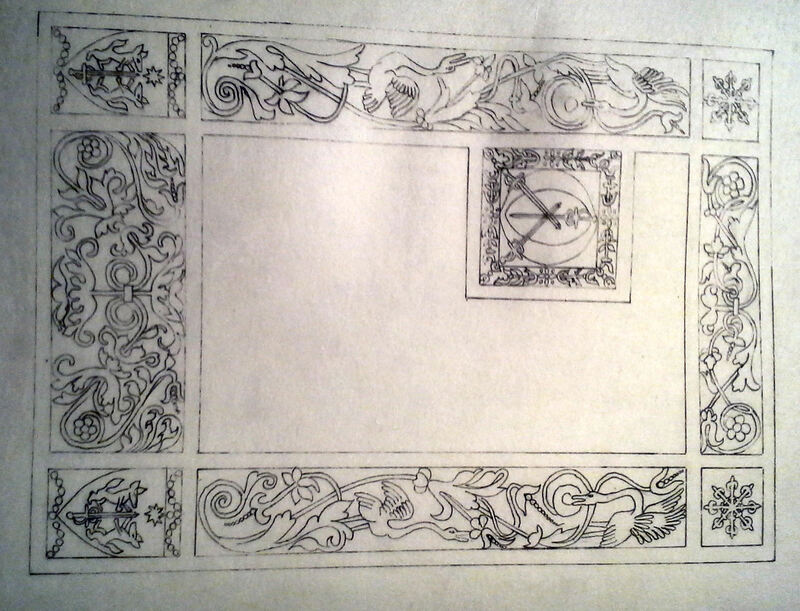 Some scribes will place a printout of the original inspiration page on a light table under the scroll paper and trace all or part of the design, while others will sketch freehand. Many will do some combination of the two. Sometimes, a scribe will not directly copy a single page from a manuscript but instead pull elements from multiple pages of the manuscript or even multiple manuscripts of the same style to create a completely new design. Even when a design is a close replica of its inspiration, it usually needs to be modified to incorporate things like order badges and recipients’ arms. Depending on the complexity of the design, and whether the scribe is tracing or drawing freehand, sketching can take anywhere from an hour or two to several days. When I could finally begin sketching, I starting by ruling off the dimensions of the finished scroll since the parchment was an irregular size, and marking the major blocks of the design in pencil. Like most scribes, I always make sure the finished scroll fits in a standard sized frame to reduce framing costs for the recipient. Then I could begin sketching all of the elements of the illumination. This took several days since I was sketching freehand. Also, I needed to adapt the design to incorporate the badge of the Order of Defense and the badge of the Kingdom, as well as Don Orlando’s arms. Here’s the final sketched version. Once the sketch is complete, most artists will go over the pencil lines with ink. Some use modern tech pens while others may use very thin metal dip pens called “crowquills.” This cleans up the design and clarifies it for the artist. After the ink dries, the pencil lines are erased. Again, depending on the complexity of the design, inking can take a few minutes or a few hours. Here’s Don Orlando’s scroll inked. Most scribes calligraph (or write the words of the scroll) before painting the illumination. This is done in case a serious error or “typo” turns out to be unfixable, in which case if the artist has to start over, not too much time is lost. Minor errors can usually be fixed, but sometimes a really major issue can make the scroll irreparable. Calligraphic errors have, alas, existed from the start of the written word; medievals even had a “patron demon” of typos, named Titivillus! So, doing the calligraphy first ensures that serious errors don’t result in throwing away a completed painting. Of course, before doing the calligraphy, the scribe must have a wording. In Æthelmearc we have a lot of leeway to write creative scroll texts, and there are guidelines available on the Kingdom Scribal website as to the required elements. Some scribes are good with writing texts, but others are more comfortable having someone else “wordsmith” the scroll text. That can take anywhere from a few minutes to a few days. The amount of time it takes to calligraph a scroll is highly variable, based not just on the length of the text but also the scribe’s familiarity with the hand. I always do a test run on tracing paper before putting pen to the real scroll, mostly to make sure the words will fit and fill the page in a pleasing way, and that the calligraphy is the right height proportional to the border. That means I do the entire text twice for every scroll. However, if the hand is one I’ve never done before, I might need a couple of days of practice to get it to the point where I’m confident I will do it well, and only then can I begin doing the test version. Before calligraphing, the scribe needs to either rule guidelines in pencil or place the scroll on a light table with guidelines behind it to ensure that the text is straight and the letter heights are consistent. After the calligraphy is dry, any penciled guidelines are erased. A typical scroll for which I already know the hand will take me one to two hours to calligraph, including the test run and then the actual scroll. If the scroll is going to have real gold leaf on it, applying it must be the next step. Gold will stick to many paints, so you don’t want to paint the scroll until the gold is done. 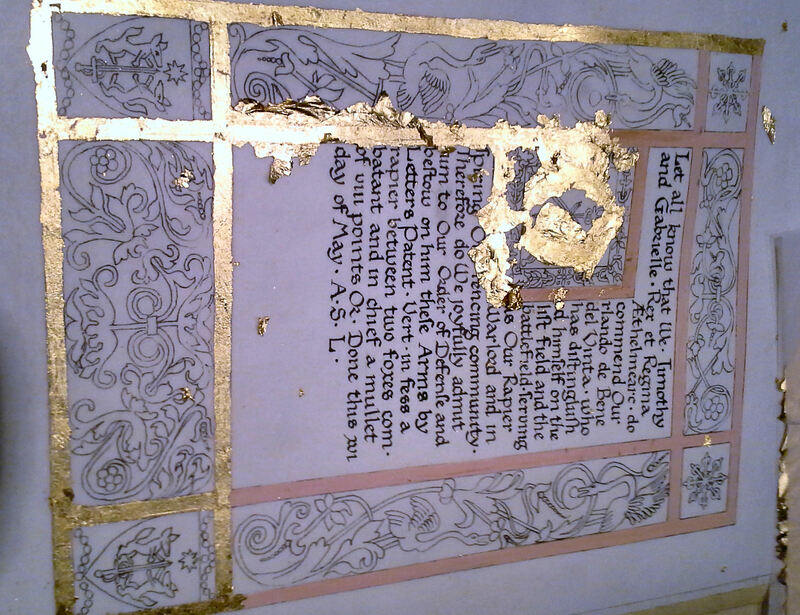 Gold leaf is attached to the page by painting an adhesive known as gesso, or size, to the areas to be gilded. The gesso is left to dry for at least an hour; more typically for several hours or a day, depending on the humidity. Humid weather can prevent gesso from drying at all, which can seriously delay the scribe; dry weather can prevent the gold from adhering to the gesso. I once had a peerage scroll whose gesso refused to dry for an entire week during an especially hot and sticky summer, and I had to resort to taking the scroll someplace where there was air conditioning! Once the gesso is set, the artist cuts the gold leaf to the size of each section of illumination, breathes on the gesso to rehydrate it slightly, and applies the leaf one section at a time, rubbing it gently to make sure it adheres properly. After it’s affixed, the scribe uses a soft brush to remove excess gold. It’s often necessary to apply multiple layers of gold to achieve full coverage. After the gold has set, typically at least overnight, the scribe then uses a polishing stone called a burnisher to buff the gold so it both adheres fully and also shines up nicely. 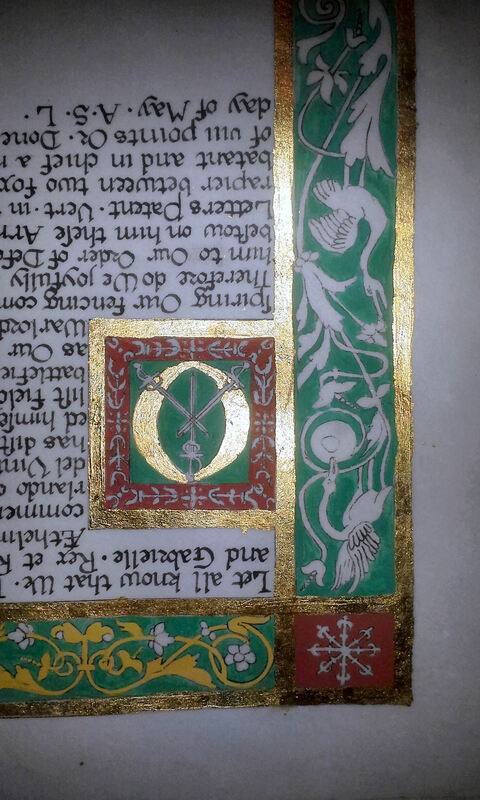 The scribe must also clean up the edges of the gilding, since excess gold will make the illumination look ragged. I usually use an Exacto blade to scrape excess gold from around the edges of the illumination. Again, depending on the complexity of the design and how cooperative the weather is, gilding can take anywhere from a couple of hours to a week or more. Given that it’s done with real gold, it’s no surprise that gilding is expensive. Each sheet is hammered very thin but, hey, it’s still gold. A book of 25 sheets of loose leaf gold, with each sheet being 3-3/8″ square, runs $50 to $60 plus shipping, so that’s about $2.25 per sheet. Not too bad if you don’t use too much of it. Don Orlando’s scroll took about three sheets of gold leaf. I forgot to take a photo of just the calligraphy, but this one shows the calligraphy complete and the gilding in process. The pink portions have been painted with gesso but the gold has not been applied to those sections yet. Notice that gold has been applied to the middle section but has not been cleaned up yet. Overall, the gold looks very uneven and messy, but that will be fixed by adding more layers of gold and then scraping the edges to straighten up the lines. Once gilding is complete, the scribe is finally ready to paint the scroll. If they already have paints available, they can start painting right away, but scribes who use period pigments may need to grind fresh paint. This typically involves taking powdered pigment and mixing it with water and a binding agent like egg yolk for tempera, glair (egg white), or gum arabic, and then using a glass or stone implement to grind the powder finer while incorporating the liquid into it. Some people use a mortar and pestle, others use a tool called a muller and grind their pigment on a flat ceramic, glass, or marble tile. The amount of grinding required varies significantly depending on the material from which the pigment is made. Vegetable-based pigments grind quickly, soft stones a little more slowly, and harder minerals take the longest time. Some pigments change color as you grind, requiring the artist to check the pigment periodically while grinding to verify that the appropriate color has been achieved. Painting the scroll is usually a multi-layer process. For most designs, a base coat is applied to the larger areas of the scroll, and then different tints may be applied on top of that, especially if the artist is attempting to achieve a three-dimensional effect. Sometimes paints must be mixed to achieve exactly the right shade for a face or a flower. Limning is the art of shading figures and objects by using a fine hatchwork of brushstrokes. 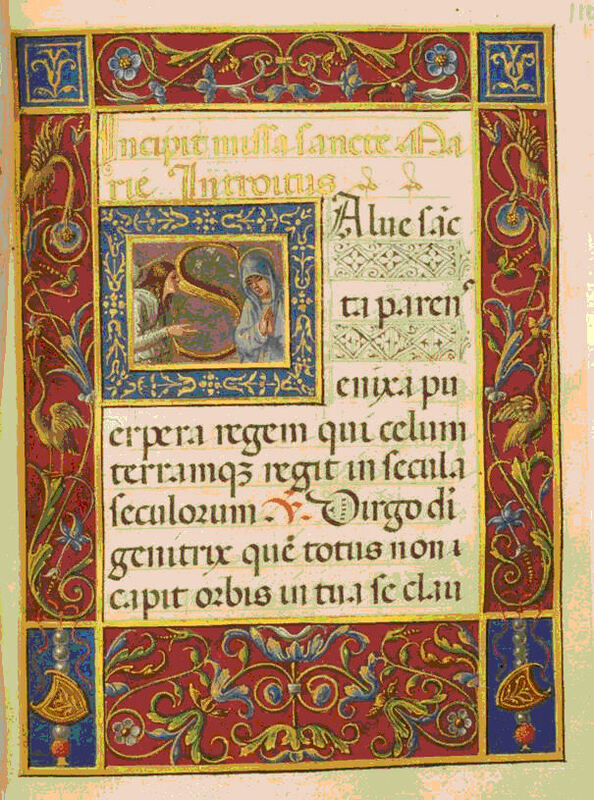 Another technique common to 13th and 14th century French and English manuscripts is called whitework, in which abstract squiggly lines are applied with white (or sometimes yellow) paint on borders or capital letters using a very fine brush. Both of these techniques require a delicate touch and great patience to achieve good results. Again, depending on the complexity and size of the design, painting can take a few hours or multiple weeks. Don Orlando’s scroll was painted using only a few colors in period pigments like malachite, cinnabar, yellow ochre, and Naples yellow. Although the original scroll was primarily burgundy red and slate blue, I modified it to green and yellow since those are his armorial colors. First I did the underpainting of the base colors, then added the highlights and lowlights to make the vines and animals seem more three-dimensional. In the left-hand picture, you can see the underpainting in progress, while in the right-hand picture, highlights and lowlights have been added. 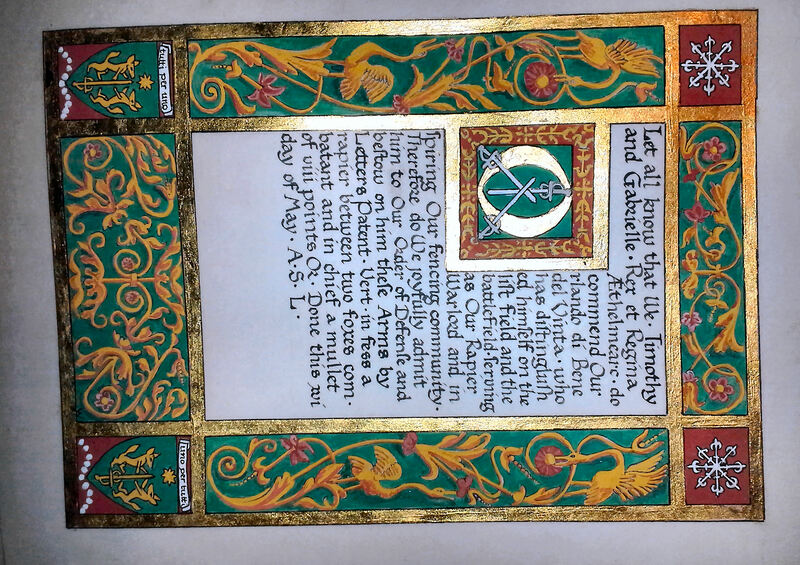 For Don Orlando’s scroll, not all sections were re-inked because the original inspiration page did not have outlining around the leaves and birds, but the gold border, armory, and some other elements were re-inked for clarity and neatness. Here’s the finished scroll, all cleaned up. Oh, and scribes who are being kind to the heralds will also type up a “cheat sheet” with the scroll text and affix it to the back of the scroll, so the herald can more easily read it aloud in Court. You’d think we’re done now, right? Not quite…. Finally, the scribe is responsible for making sure the scroll is delivered to the event where the Royalty plan to give the award. If the scribe is going to the event, this is pretty easy – when he or she arrives, the scribe finds the Signet officer of the day, or the Court Herald, and drops off the scroll. But if the scribe is not going to the event, he or she must either find someone to transport the scroll, or mail it to the Crown well ahead of the event to ensure that it arrives in time. Again, the expense of mailing the scroll is usually borne by the scribe. If the scroll is large or needs to be sent overnight, mailing it can cost as much as $15, and of course the scribe also has to acquire an appropriate container to mail it in. I was fortunate that this scroll was given at Æthelmearc War Practice, which I was planning to attend anyway, so I didn’t need to mail the scroll. However, given that the forecast was for rain and it was a camping event, I took the precaution of purchasing a frame to protect the scroll from the weather and keeping it in a waterproof case. Let’s use the Bureau of Labor Statistics’ mean hourly rate for fine artists, which is just over $24/hr. A fairly simple scroll at the lowest end of time commitment as listed above (10.5 hours) would then cost over $250 just in labor. A 100-hour scroll would cost $2,400, again, just in labor. (Thanks to Meesteress Odriana vander Brugghe for those figures). I didn’t track the number of hours I spent on Maestro Orlando’s scroll, but I’d guess it was probably in the 50- to 75-hour range. Many years ago, I did a very large and extremely complex Knighthood scroll for a dear friend and gave up trying to track my hours about 3/4 of the way through when I was well past the 100-hour mark. It should go without saying that scrolls need be protected from water and dirt. We are fortunate in Æthelmearc that most of us receive a scroll case from the Signet right there in court after receiving our scroll, but that scroll case should be returned once your scroll makes it home so it can be used at another Court. Of course, you really want to frame your scroll and put it on the wall, right? 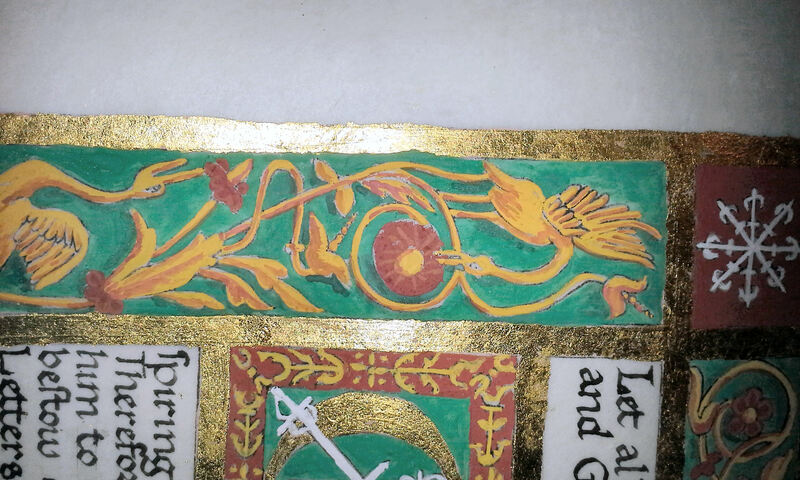 For scrolls with gold leaf on them, it’s important to keep the gilding from coming in contact with paper or other objects to which it might stick. 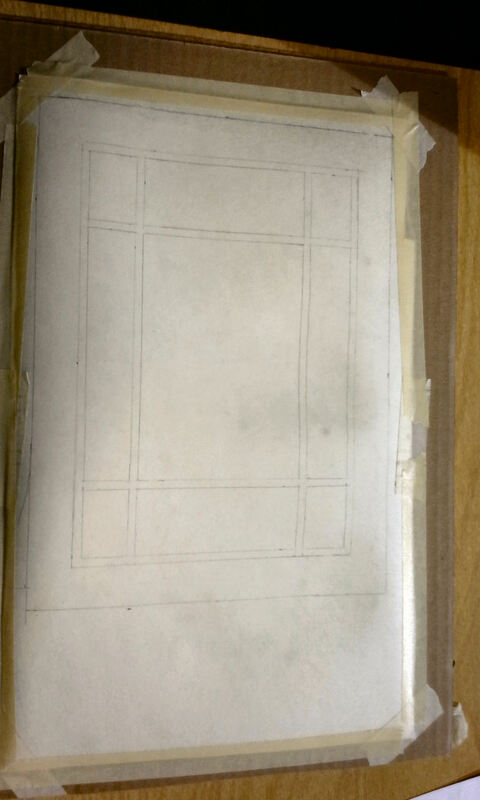 One way to do that for unframed scrolls is to place a sheet of glassine over the scroll. Glassine is the glossy paper in which sheets of stamps are sold, so if you go to the post office and buy a sheet of stamps for sending holiday cards, save that glassine sleeve! When you do frame scrolls with gilding, make sure there’s a mat to keep the scroll away from the glass of the frame. Forget what you’ve seen in the movies – scrolls should never be rolled or (heaven help us) folded. They should be stored flat until they can be framed. Rolling can cause the paint to flake off or severely damage the paper or parchment. Keep them in a dry place, because moisture can also damage the paints or any gold leaf. Once your scroll is framed and ready to hang, it’s a good idea to put it on a wall that doesn’t get much sunlight. Many paints and inks are not lightfast; my Award of Arms scroll from 1979 is so faded that it’s almost illegible. After learning all this, you may be wondering why anyone would want to be a scribe! If each scroll takes so much time and potentially costs that much money, why would anyone want to make them? The answer varies from scribe to scribe, but generally you will find that the scribes of the SCA love doing their art and see their work as a service to the Society. They also enjoy seeing the expressions on the faces of the recipients when they behold their scrolls for the first time. Sadly, it’s rare that a scribe receives so much as a spoken thank you. In 38 years as a scribe, creating at least 1,000 scrolls, I have been pleased to receive a few thank you cards and emails, and even a couple of small gifts from scroll recipients. So, next time you receive an award scroll, remember that it’s a gift of time and cash as well as beauty from the scribe, and let them know how much you appreciate their work! Personally, I was delighted and honored to do Maestro Orlando’s scroll for him. He and I had been friends for several years, and I have long admired him as both a fencer and a leader on the rapier field, so I was thrilled when he received his Writ. I was also pleased to have the chance to craft a scroll for a shiny new peerage order – such a rare opportunity comes only once in a lifetime. Questions? Contact me at ariannawyn (at) gmail.com, talk to your local scribe, or email the Kingdom Signet if you are interested in becoming a scribe. This is wonderful! Thank you for taking the time to break it out step by step. The next time I do a scroll, I’m going to actually time it. One thing though – you forgot the calligraphy line in your totaling-it-up table! It’s in the article, but missed the table, and that’s easily another 1-5 hours. Thanks for pointing out the omission! I will correct it. Brava to the author of that very excellent article on making a scroll! As a professional calligrapher, it bothers me that SCA scribes are rather taken advantage of, and that many scribes do not go through what I consider to be the necessary steps for making a good and period accurate (or even close) scroll. I hope that this article makes the rounds and is well read!!! Thank you so much for taking the time to share this. I really feel that you have taken the words right out of my mouth! perfect, precise article! I agree in everything you said. Scrolls are real artwork, and here you are making a very clear statement on what they are worth. Thankyou so much! Brilliant! Thank you so much for taking the time to so succinctly and accurately outline the sca scroll – making process! I will be sure to pass this on! Thank you for this! Very interesting read and gave a lot of good pointers for one like me just starting out!